I was reading a forum post on the topic of Ethereum being the future of crypto, where the poster tried to make a point regarding an article he had read in the Washington Post, which was about the underground economy. The article quotes another article by James Surowiecki of the New Yorker Magazine that alleges there is a $2 Trillion shortfall in reported revenues in the US, and, of course, a commensurate shortfall in taxes collected. The responses were, predictably, more concerned with trashing Ethereum and the poster for daring to challenge Bitcoin as the one true Cryptocurrency. I must concur that the post was rather obviously from someone punting the value of Ether, since it tried to make the case for a massive under-valuation of Ether should a small fraction (1%) of the underground economy be converted by Ethereum from cash to to cryptocurrency. However, this line of reasoning and the backlash got me thinking about a few things. There is a constant level of tension in relationships. With people there is the egotistical vs the social imperatives. With corporations there is the drive for higher profits vs public relations. Governments hunger for power vs the support of its citizenry. These dichotomies are all reflections of the underlying human failings resulting from the ego, but lets not get into an academic discourse – you know where I’m coming from. The numerous nuances and alternative forces that come into play make for complex relationships, but the point I am trying to make is simply that there are opposing forces, and they fluctuate as to where they reach a temporary balance. Against the backdrop of the uneasy relationships we maintain, we are presented with the gift of Blockchain technology. Like any gift it can be interpreted as a blessing or a curse, depending on your point of view. Blockchain offers, ultimately, a solution to the intrinsic failures of our humanity. Properly used it promises us a Utopian vision of the future where the strife we see between people, companies, and governments, can be transformed so as to allow mutually consensual rules to be applied evenhandedly and transparently. Why would we want this? Pick up any history book or newspaper and you have your answer. Coming back to the title of this article, there needs to be a progression towards restructuring our governments, corporations and relationships around the predictability and purity of the mathematical and computing wonder we have in Blockchain technology. This progression involves a period of intense development and maturing of the tech. Ethereum is a magnificent example of what can be achieved by a large number of dedicated and skilled individuals, working together for universal good rather than narrow, personal goals. It has created, and continues to create, a platform for the rest of humanity to build astonishing innovation. It may, in all likelihood, evolve into a platform that truly transforms our societies into something that resembles Star Trek rather than Mad Max. Why? Because it excludes the two greatest scourges of harmony. Corruption and Bureaucracy. Consider what it would be like dealing with a government entirely constructed around the Blockchain. Every action is subject to scrutiny, and probably to near instant consideration and voting by the government’s citizens. Any spending would be subject to similar scrutiny, participation and consensus. Would such a government have to coerce its citizens into paying taxes? Much less likely. 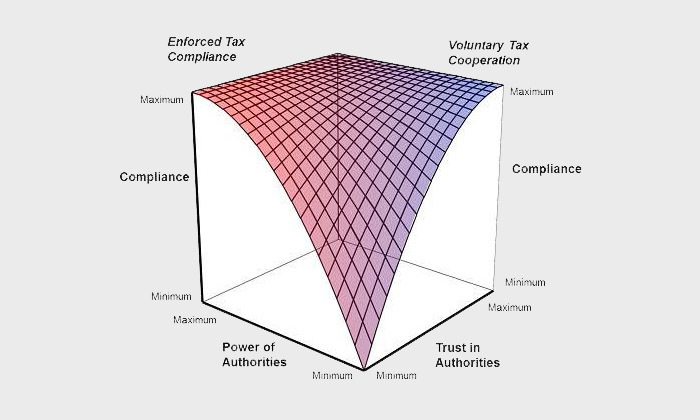 Even for those wishing to avoid taxation, there could be a built-in solution with Blockchain tech, since all DApps and DAOs could include provisions for taxation, especially since fair and equitable taxation would become a publicly provable metric. Looking at it like that, Blockchain becomes a curse for the corrupt official and the criminally minded tax evader, but is undoubtedly a blessing to officials who strive for public service and efficiency, and citizens who do not shirk their role in society.